We had previously discussed the various point and shoot as well as DSLR cameras in different budget categories on our website. The Rs.40,000 budget allows you to stretch your requirements by a lot and offers some of the best pocket-friendly professional cameras in the Indian market. The feature set available within cameras are quite substantial and a mere difference of a couple of thousand rupees can fetch you a significantly better deal. However this makes choosing the correct camera, a hell lot tougher and that’s where we come to your rescue. In this article, we bring you the best six cameras available in the Indian market priced under Rs.40,000. The Canon EOS 200D is possibly the best entry-level DSLR for professional photography. This device has so many features packed into a relatively compact and lightweight form factor that no other camera in its price bracket offers. This camera is a powerhouse despite the simple DSLR look it has. The high-quality aluminium alloy and polycarbonate build graciously coated with layers of water and dust repellent coating makes it a durable handheld camera that can be easily cleaned. The buttons and other controls are thoughtfully designed and placed instinctively at their place so that once you get used to it, it becomes automatically hardwired into your brain. This makes it operable even without having to take your eyes off the viewfinder. The pop-up flash is now a lot more improved and feels solid when compared with earlier EOS models. The 3-inch TFT LCD display at the back is retractable and swivels in different directions making tedious angle photography a delight with this camera. The Canon EOS 200D has a 24.2MP CMOS APS-C sensor of size 22.3 x 14mm. Backed by the powerful Digic 7 processor, this sensor is capable of delivering high-quality images and videos that does justice to its price tag. This camera sensor has a staggering maximum ISO range of 25,600 that will make night photography much more clear and detailed, which is a must if you are a professional or even a hobby enthusiast of low light photography. This camera comes with the Canon 18-55mm kit lens. This is an STM lens with improved focus motors that lets you control the lens manually without damaging them. The 9-point autofocus works well and is lightning fast to identify the subject in the frame. This is excellent for macro photography where the subject might be too close to the sensor and manually adjusting the focus might take some time to achieve. The Canon EOS 200D DSLR camera can capture images with a maximum resolution of 6000 x 4000 pixels at 24.2 MP. There is RAW support built-in which is preferred by professional photographers over jpg format as the latter is not compressed and can be edited in any software without degradation. When it comes to video, this camera can record full HD videos at 1920 x 1080 pixels at 60 fps. Coupled with a gimbal, this camera is very capable to produce cinematic looking videos. The images and videos come out pretty great with good tonal balance and details. If used with manual controls, this camera will deliver exactly what you wish to capture. The Canon EOS 200D comes with built-in lens aberration correction that reduces the blurs and distortions in the image automatically before capturing the picture. This reduces the need for further image processing and helps in retaining the details as it is. In the connectivity front, this camera has Wi-Fi, NFC and Bluetooth. You can connect devices such as laptops and smartphones easily with this camera to instantly share the pics and videos. The LP-E17 Lithium-ion battery pack inside this camera will last for about 400 clicks per full charge. Considering the sensor size and the STM lens involved, this is a pretty good number when it comes to battery statistics. The Canon EOS 200D is the best entry-level professional camera that money can get you under a budget of Rs.40,000. The powerful Digic 7 image processor and rich connectivity features help you shoot and share excellent quality stills and videos wirelessly on the go. Nikon cameras are well-known for their digital imaging prowess in the DSLR segment. The company has a loyal fan following owing to the simplicity of use and constant innovations to make the visual output more appealing to the end users. The Nikon D5600 is a premium mid-range DSLR camera in the Indian market available for just under Rs.40,000. The build quality of this DSLR camera is outstanding with the use of hard polycarbonate plastic materials and rubber inserts over a metallic inner frame. The chassis is rigid and weighs about 465 grams without the lens kit. The carefully designed grooves on the body match the normal palm and finger resting positions, adding to the ease of use of this camera. The buttons and dials are laid out the same as found on other Nikon DSLR models. If you’ve used Nikon products in the past, this will make you feel home. The Nikon D5600 comes with strap clipping options integrated into the body to improve safety and portability. The Nikon D5600 has a 24.2MP CMOS sensor inside measuring 23.5 x 15.6mm. This sensor capture shots with excellent dynamic range and also significantly improved frames per second count. The kit lens which comes with this DSLR camera is a DX NIKKOR 18-55 mm AF-P VR lens. AF-P lenses are known for its accurate focusing mechanism and being a VR lens, the jitters and blur on the captured shots are almost non-existent. This camera sensor is capable of clicking pictures with a maximum ISO of 25,600 and this makes it a better low light photography machine. There are 39 autofocus points to keep the subject well in the frame. Both landscape and portrait mode photos look excellent and rich in details with this sensor. Whatever be the lighting situation, the Nikon D5600 really shines to provide the best possible image quality. The pictures taken by this camera has a lot of details and the wider colour gamut results in vivid and punchy images. The CMOS sensor has got it covered when it comes to the dynamic range. The deep blacks and brightest brights are well preserved, making the image look as close to reality. Speaking of the video quality, the Nikon D5600 is capable of recording full HD 1920 x 1080 pixel resolution videos at 30 fps. Although this is not the ideal video camera for vloggers, it can come in handy at times if the need arises so. The large 3.2-inch retractable touch-enabled display is ideal for shooting pictures at odd angles without having to guess about the frame you’re about to capture. This device comes with Wi-Fi connectivity which can be used for sharing photos and videos wirelessly to your smartphones or laptops without any fuzz. The wide range of Nikkor accessories such as lens kits makes this camera a versatile addition to any travellers backpack. The Nikon D5600 comes with a rechargeable Li-ion battery pack for powering its functions. This battery pack can roughly last for 1000 shots and for about 2 hours of intermittent video recording at full HD, 60 fps. If you want a cross-over between a high-end DSLR but under an affordable budget, the Nikon D5600 is a great piece of hardware, to begin with. This camera ticks almost all right boxes for its price and then some, making it a value for money deal under Rs.40,000. Canon EOS series has been a photographer’s holy grail since its inception. The EOS 1500D from Canon is a much more affordable successor to its expensive, high-priced siblings with a decent set of features agreeable for its price tag. The design and form factor of most EOS devices from Canon looks similar but differs only in functionality. Even though made from tough ABS plastic material, the camera is lightweight. The cleverly designed contours of this camera make it easy to hold in hand without slipping down. Along with the built-in flash, there is an external flash holder to integrate third-party lighting solutions to make your photos look more professional and stylish. The 3-inch LCD display at the back is reasonably bright and displays the images and videos with decent details. The 24.1MP CMOS sensor in this DSLR camera has a size of 22.3 x 14.9mm which makes it suitable for doing some serious professional photography. This APS – C sensor is very lightweight and has a narrow field of view which aids in better zooming capabilities. You get two lens kit with this package, which makes it one of the best deals currently going on in the market. The first lens kit that comes with this camera is the popular 18-55mm Canon zoom lens which delivers excellent daylight landscape photography experience. Built-in with 3x optical zoom, this lens can be used to capture occasional close-up shots as well. The second one is the 55-250 IS lens. This is a small and compact telephoto lens that can be used to film long distance subject with adequate lossless zoom. This camera comes with a Digic 4+ sensor with 9 focus points and a single cross point focus, altogether 10 in total. With the maximum ISO range of 12800, this camera works decently in low light conditions as well. The Canon EOS 1500D can capture still photos with a maximum resolution of 6000 x 4000 pixels both in .jpg and RAW formats. The photos that come out of the sensor looks true to the actual subject with well-detailed curves and contrast levels. The ‘lens shift-type image stabilizer’ works well to reduce the blur in the picture while capturing zoomed in shots with hand. This camera is capable of recording full HD videos with a resolution of 1920 x 1080 pixels in .mov format. The video seems a bit jittery and washed out compared to the Nikon cameras but OK for the asking price. The Canon EOS 1500D has a whole suite of connectivity options to share and sync with other devices either by wired or wireless means. This device has Wi-Fi and NFC that will let you connect compatible devices such as laptops and smartphones just with a tap to sync the content. With the HDMI port on this camera, it can be hooked up to a large monitor to preview the photos and videos directly. The Canon EOS 1500D uses the same LP-E10 battery pack that powers most of the budget EOS lineup. This battery is rated for an average of 600 clicks per charge. However, using features like Wi-Fi may significantly affect battery life. The Canon EOS 1500D is one of the best entry-level DSLR cameras that lets you master the art of professional photography in the best possible way. High-quality lens and sensor coupled with the powerful Digic 4+ image processor make this camera, one of the best in the business under Rs.40,000. The Sony ILCE-6000L is a compact mirrorless camera featuring a full-sized APS-C sensor and a flip out display. Best suited for vlogging, this digital camera from Sony has one of the best continuous autofocus systems we have seen while recording a video in the sub Rs.40,000 price segment. The body of this camera is made of aluminium inner casing and polycarbonate outer layer. This camera is intentionally designed to be lightweight and compact which suits vlogging and point and shoot usage. At the back, this camera has a flip screen that can be titled to face front side, which makes the job a hell lot easier for vloggers who would like to see what’s happening during real-time recording the content. The buttons and dials are a bit cramped, mainly because of the size constraints to make this camera as small as possible. There is no headphone jack to plug in an external mike, which is kind of a bummer as you would have to rely on an external audio recorder to capture high-quality audio. Weighing only about 344g, this camera can be used to vlog or shoot photos for an extended period of time without any strain to your hands as it is definitely lighter than the DSLR cameras out there. Sony APS-C sensors are critically acclaimed for its image and video quality and are one of the best in the business. The sensor on this compact mirrorless camera has a size of 23.5 x 15.6mm and being a mirrorless camera, it is always open to the light coming through the lens. This sensor has a maximum ISO range of 26,500 which makes it easy to shoot images and videos at low lighting conditions. This camera features a Sony E-mount that has a 16-50mm kit lens. There are many other Sony lenses available for this camera and with the help of an adapter, you can use many other third-party lenses as well. This Sony ILCE-6000L can capture still photos with a maximum resolution of 6000 x 3376 pixels at 24.2MP. There is also support for various picture standards such as RAW, JPEG fine and JPG standard. The photos from this camera come out vibrant and rich in details. The super fast focus system aides in capturing the subject as soon as you point towards it. Talking about the video, there is no 4K recording available but with full HD 1920 x 1080 pixels video at 60fps with 50MB/s bit rate, vloggers have a compact and lightweight tool in hand for producing high-quality video content. One of the main drawbacks of this camera is that the display in the back is of low resolution and doesn’t do justice to the original image and video quality from the sensor. There is a ton of automatic shooting modes that you can set according to the nature of the subject or time of the day to make the final output look way better than it would be if shot at normal mode. Mirrorless cameras usually exhibit less battery life than DSLR counterparts. This digital mirrorless camera from Sony lasts for about 420 still images or about 75 minutes of continuous video recording in a single full charge. If you’re a vlogger/content creator and want a compact and lightweight camera to shoot your stuff in style and quality, the Sony ILCE-6000L is the best for a budget under Rs.40,000. The flip screen and the interchangeable Sony lens ecosystem to enhance the usability of this camera makes it a good choice for professionals as well as individual hobby photographers. Nikon D3400 is undoubtedly the best DSLR camera that you can purchase for a budget around Rs.30,000. As this model sees frequent demand surges, the price fluctuates a lot and when writing this article, the asking price of this camera is about Rs.32,000. The body of this budget DSLR camera is built using a mix of high-quality fibre and ABS plastic. The construction screams quality and when taken in hand, this camera feels durable and solid. The control buttons are strategically placed to ensure you a smooth workflow without having to take your eyes off the viewfinder. The textures dials are smooth and easy to operate with a single finger. The satisfying click sound makes sure that you have indeed nailed the click. The faux leather grip makes it easy to hold this camera even with sweaty palms. However, we recommend you to use a wrist strap to ensure the safety of the device. The 3-inch TFT LCD display at the back is of good quality but unfortunately, it is not tiltable. If you wish to do some serious low light photography, there is a dedicated external flash holder integrated with the chassis. The 24.2MP CMOS sensor in this DSLR camera has a size of 23.5 x 15.6mm, the best you can get in its price segment. A larger sensor is always preferable than a higher megapixel count. The bigger the sensor, more the light it can capture and better will be the image quality. This camera comes with an 18-55mm AF-P Nikkor lens which brings you the latest vibration reduction technology to the table for blur-free zoomed in shots. This lens features manual focus that lets you zero in on the desired subject in case the autofocus fails to do so. With 11 focus points, this camera is undoubtedly the best DSLR camera that you can buy under Rs.30,000 for macro photography. The 24.2MP CMOS sensor can capture still images with a maximum resolution of 6000 x 4000 pixels. There is RAW support built-in which will make professional photographers happy. RAW format helps you to edit the captured images in an editing software without any colour degradation or loss in detail. The images come out very good with an excellent level of detail and colour accuracy. When it comes to videos, the Nikon D3400 can capture full HD videos with a resolution of 1920 x 1080 pixels at 60fps. This budget DSLR camera has a maximum ISO range of 26000 which makes low light and night photography a breeze. However, invest in a good tripod if you plan to take some professional quality photos in these conditions. Nikon’s standard PictBridge feature is present on this camera that lets you hook the device with other gadgets such as printer wirelessly. The Nikon D3400 also has Bluetooth v4.1 low energy mode for energy efficient wireless connection. The Nikon D3400 delivers about 150 minutes of continuous usage and will take an average of 400 photos on a single charge. If you are looking for a full-fledged DSLR camera at an affordable price, the Nikon D3400 checks all the right boxes. This camera is best suited for serious content creators who want a budget camera that captures high-quality detailed images and cinematic videos. With vlogging being a fast catching trend among the Indian youth, this camera is one of the most sought-after devices for this purpose. 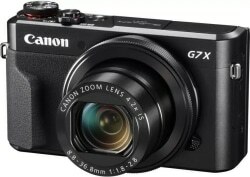 The Powershot G7X Mark II from Canon is an ultimate imaging powerhouse built into a sleek and elegant chassis that is comfortable and lightweight to handle for extended period of time. The G7X Mark II is built on an aluminium frame with thoughtful curves. The steel buttons and dials exude confidence in the build quality of this device. Everything is neatly arranged with enough spacing between the controls that won’t strain your fingers to do twisting and turning to reach the buttons. The 3-inch TFT LCD display at the back can be tilted 180 degrees upwards and 45 degrees downwards that will provide you with abundant experimental shooting angles. There are metal hooks on either side that can be utilized to connect a wrist strap to ensure that this camera won’t slip away from your hand accidentally. The Canon G7X Mark II comes with a large 1-inch sensor that makes bokeh mode photos possible with this camera. This sensor has a maximum ISO range of 1600. The powerful Digic 7 image processor inside this camera performs high-speed image processing and noise reduction even in photos and videos taken at maximum ISO value. The integrated Canon zoom lens has an optical zoom of 4.2x and works pretty well, considering its size. The auto lighting optimizer feature found on high-end Canon EOS cameras finds its way to the G7X Mark II. This feature adjusts the light entering the sensor and prevents the washing out of images at sudden exposure situations. The Canon G7X Mark II can capture still images at a maximum resolution of 4864 x 3648 pixels in 4:3 aspect ratio. The photos captured by this camera come out with natural colours and excellent level of detail for a point and shoot camera. There is little to no noise in photos taken at higher ISO range with this device. When it comes to videos, the Canon G7X Mark II can shoot at full HD with a resolution of 1920 x 1080 pixels at a steady 60fps. This device comes with dual sensing image stabilization feature that combines the data from gyro sensor and image sensor to reduce the shake and blur when capturing images and videos. The new Digic 7 processor is a very capable image processor and can do well beyond reducing the noise in the shots. It is capable of continuously tracking a moving subject even when a new subject is introduced into the scene. This is great for vlogging as the creator must be in constant focus while talking with the audience even if multiple people walk by the location. The Canon G7X Mark II provides an impressive battery life for its size. This camera can take an average of around 350-400 shots on a single charge. Talking about video capture, the battery lasts for about 1-1:30 hours of continuous recording. If you’re a vlogger or planning to start vlogging, nothing gets better than owning a Canon G7X Mark II. Its lightweight chassis coupled with a high-quality sensor that has dual sensing stabilization plus the tiltable screen makes it the best camera for vlogging under Rs.40,000. There it is. The best six picks among the digital cameras priced under Rs.40,000 has been listed and reviewed in this article. If you feel we’ve missed something, do let us know in the comment section below. Meanwhile, do consider subscribing to our weekly newsletter for the latest updates about gadgets and best buying lists with detailed reviews right in your inbox. Thanks for your time and have a pleasant day ahead.